— Short answer: Just like any other generation has done it before. It requires sacrificing short-term gratification in lieu of long-term gains. This is a difficult concept for many. A recent survey concluded that millennials place homeownership above other life priorities. Another study showed how young people believe they’ll get rich: 21% by winning the lottery, 11% through an inheritance, and 3% by way of an insurance settlement. – Good luck with that. I met a couple that has been renting on Oahu and wanting to buy a Honolulu condo for the last 8 years! They shared with me their fear of potentially making a mistake with buying when prices are at peak levels. Can you calculate how much money was wasted renting during the last 8 years and how much real estate values have increased since? There appears to be a gap between perception and reality. For millennials or any other generation, nobody said it was going to be easy, but it is simple! First, you need to improve your mindset, because most of it is mental. If you are committed to staying at least 3-5 years, most likely you are better off buying. Fear could be an unnecessary imagination of an unlikely worst-case scenario. Lightning strikes are dangerous but the probability of getting hit is low. It is the same fear that is holding back many from investing in the stock market. There has never been a 15-year time period where the US stock market has lost money. That is true for Oahu real estate too. Could the fear of a possible market correction be greater than the actual threat? Trying to time the market is futile. Rather than speculating, keep a long-term perspective when you are buying your home. You have the ability, tools, and resources to obtain home ownership just as any previous generation had. You are not doomed because of ever deteriorating market conditions. Don’t fall for this popular declinism bias. Some believe that buying a home in Hawaii today has become harder than ever before. Based on what evidence? Because the graph shows that prices moved up? During the last 42 years, only two time periods have been more affordable than today: 1976-1977 and 1998-2004. 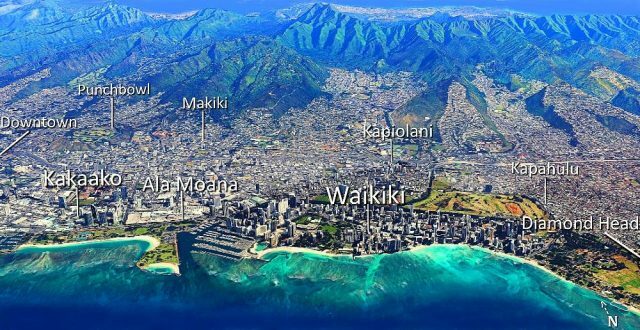 In fact, Oahu’s affordability today is a lot closer to the lower end of the range and nowhere close to its historical top range. 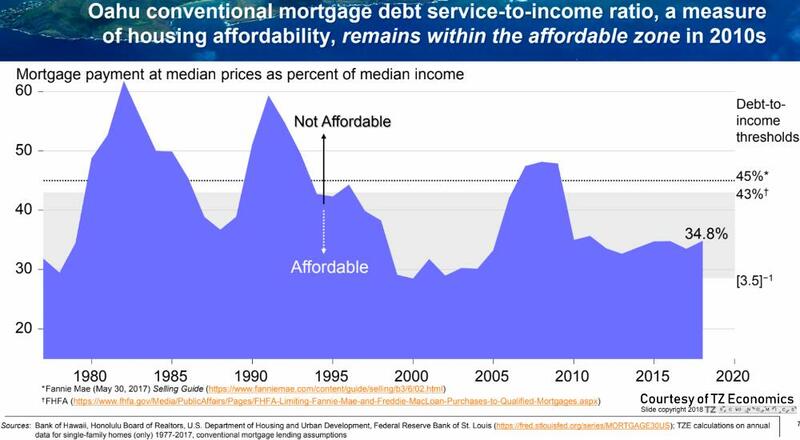 Yet, everyone thinks today’s prices are ‘ridiculous’ and it is nearly impossible to buy a home. See related article Oahu’s Housing Affordability – Trying To Time The Market? It turns out that every generation of home buyers struggled to buy their first home. I don’t expect that to change. In my book, Buying Paradise, I interviewed 18 Hawaii homeowners. All of them sacrificed immensely, regardless if they bought 10, 25, or 50 years ago. It was never easy and it did not magically happen by itself. Besides overcoming your fear, you need the willingness to commit to the right long-term plan. Like any home buyer before, you are powerful and more capable than you think. With focus, a clear mental representation and deliberate action, you can do it too! Reevaluate if there are better paying job opportunities available. There has never been a better time to upgrade your job! Honolulu unemployment is at 2%. US unemployment is at 3.7%. These are the lowest unemployment rates in 50 years! – Negotiate a pay raise, or work an additional side job. Upgrade to a better paying job in the same industry but be careful switching careers before buying. Mortgage lenders prefer to see a steady continuation with an improving income history. I know some first-time home buyers that temporarily worked three jobs to afford their purchase. I’m not kidding. Everyone that ever bought their first home was committed to doing whatever it took. There are no exceptions or shortcuts. a) Pay off your credit cards in full every month and never carry a balance to the next month. – This should be your #1 financial rule in life. I recently read that 70% of all US credit card holders carry a balance! Even more shocking, 50% of them only pay the monthly required minimum!? If you can’t pay off your balance in full, you’ll pay an unnecessary premium in life. It’s like swimming with bricks on your legs. Automate your payments so that you never miss a due date to pay your balance in full. If you struggle with multiple high balances, then pay off the balance with the highest interest rate first. Pay off the 2nd highest interest rate next, etc. until all done. b) Consciously forego unnecessary purchases. – Do you really need the largest flat screen TV or a shiny brand new car with hefty car payments to keep up with the Jones’? Perhaps it’s time to analyze your monthly budget and see where all your money goes. Regardless if you earn $50K 0r $300K a year, this applies to anyone if you have no money left at the end of the month. You must resist the urge to spend your paycheck. No impulse buying. Trust me, that’s what everyone did that ever bought a house before. Automate your savings into a dedicated savings/investment account. You will need cash for a down payment and closing costs unless you buy with a VA, or USDA loan. Even with a 0% down payment loan, you will still need cash reserves as a financial cushion. The best loan rates are available when you apply a 20% cash down payment. It takes time to save. Get started today unless you own a golden goose that magically delivers. If you can’t pay your bills on time, then don’t expect the bank to offer you favorable mortgage financing. Don’t take this lightly. You must demonstrate excellence in repaying debt. The best loan programs are available if your FICO credit score is above 740. Anything less diminishes your borrowing power and chances of owning your home. Nobody starts at the top. Get pre-approved for a mortgage loan before you start looking at any properties. Don’t surrender because you can’t afford your dream home. Consider what you can afford today and evaluate if it is adequate for now. That’s what every first-time home buyer did before. Buying a starter home/condo gets you out of the renting business and enables you to automatically build equity. The sooner you start with what you can afford and deliberately build on it, the better your chances to eventually afford your dream home. There are no guarantees in life but that’s how it worked for many home buyers before. For some, it took several stepping stones. There is no magic pill for buying a home in an expensive market. It requires sacrifice, compromise, resourcefulness, and initiative. Do the best you can with what you got. The key is to get started and become disciplined. Consciously develop the necessary habits to improve your chances for an eventual purchase. – Congratulations! You arrived. That’s how everyone has done it before.